This article is about the descriptive term used in mineralogy. For the addictive drug, see crystal methamphetamine. In mineralogy, crystal habit is the characteristic external shape of an individual crystal or crystal group. A single crystal's habit is a description of its general shape and its crystallographic forms, plus how well developed each form is. Recognizing the habit may help in identifying a mineral. When the faces are well-developed due to uncrowded growth a crystal is called euhedral, one with partially developed faces is subhedral, and one with undeveloped crystal faces is called anhedral. The long axis of a euhedral quartz crystal typically has a six-sided prismatic habit with parallel opposite faces. Aggregates can be formed of individual crystals with euhedral to anhedral grains. The arrangement of crystals within the aggregate can be characteristic of certain minerals. For example, minerals used for asbestos insulation often grow in a fibrous habit, a mass of very fine fibers. The terms used by mineralogists to report crystal habits describe the typical appearance of an ideal mineral. Recognizing the habit can aid in identification as some habits are characteristic. Most minerals, however, do not display ideal habits due to conditions during crystallization. Euhedral crystals formed in uncrowded conditions with no adjacent crystal grains are not common; more often faces are poorly formed or unformed against adjacent grains and the mineral's habit may not be easily recognized. Factors influencing habit include: a combination of two or more crystal forms; trace impurities present during growth; crystal twinning and growth conditions (i.e., heat, pressure, space); and specific growth tendencies such as growth striations. Minerals belonging to the same crystal system do not necessarily exhibit the same habit. Some habits of a mineral are unique to its variety and locality: For example, while most sapphires form elongate barrel-shaped crystals, those found in Montana form stout tabular crystals. Ordinarily, the latter habit is seen only in ruby. Sapphire and ruby are both varieties of the same mineral: corundum. Some minerals may replace other existing minerals while preserving the original's habit: this process is called pseudomorphous replacement. A classic example is tiger's eye quartz, crocidolite asbestos replaced by silica. 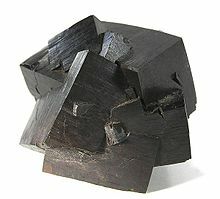 While quartz typically forms prismatic (elongate, prism-like) crystals, in tiger's eye the original fibrous habit of crocidolite is preserved. Predominant crystal faces (prism – prismatic, pyramid – pyramidal and pinacoid – platy). Crystal forms (cubic, octahedral, dodecahedral). Aggregation of crystals or aggregates (fibrous, botryoidal, radiating, massive). Crystal appearance (foliated/lamellar (layered), dendritic, bladed, acicular, lenticular, tabular (tablet shaped)). ^ Hanaor, D.A.H; Xu, W; Ferry, M; Sorrell, CC (2012). "Abnormal grain growth of rutile TiO2 induced by ZrSiO4". Journal of Crystal Growth. 359: 83–91. arXiv:1303.2761. Bibcode:2012JCrGr.359...83H. doi:10.1016/j.jcrysgro.2012.08.015.